1. This Court has jurisdiction over the subject matter of this action pursuant to Wis. Stat. 2. Venue is proper in this Court pursuant to Wis. Stat. § 801.50(2)(a) because Buffalo County is the county where the claim arose. 3. O’Connor is an individual residing in Buffalo County at S1287 Wisconsin Highway 88, Gilmanton, Wisconsin. 4. Buffalo County is a body corporate in the State of Wisconsin, duly organized under Wis. Stat. Ch. 59 as a county with its offices located at 407 South Second Street, Alma, Wisconsin 54610. 5. The Buffalo County Board of Adjustment is as a quasi-judicial body of the County as provided for in Wis. Stat. § 59.694 and in the Buffalo County Zoning Ordinance. 6. Buffalo County has a Zoning Ordinance that defines the various districts in the county, permitted uses, conditional uses, and the procedures used in administering the Zoning Ordinance. 8. One of the districts created by the Zoning Ordinance is the Agricultural District. (Zoning Ord. Art. I.) Among the permitted uses to which agriculturally zoned land may be put are: any uses allowed in the Residential District; farming; dams; roadside stands; mobile homes for farm workers; and accessory farm buildings. 11. Buffalo County’s Zoning Ordinance contains only one provision relevant to mining. 14. The uses allowed in the Industrial District are limited to things such as service stations, auto body shops, public utilities, and warehouses. 15. The Zoning Ordinance also allows for a limited number of conditional uses in the Industrial District upon issuance of a permit, including certain manufacturing, fabricating, processing, packing, or storage of items, automobile salvage, wrecking, and junk scrap. 16. A party may apply to the County for a CUP by submitting information and documents required by the Zoning Ordinance or as may be required by the Buffalo County Board of Adjustment (“BOA”). 17. Any CUP application must include a map of the type described in section 202 of the Zoning Ordinance, and may include any of the evidence listed in section 211 or other information required by the BOA. (1) the location, nature, and size of the proposed use; (2) the size of the site in relation to it; (3) the location of the site with respect to existing or future roads giving access to it; (4) its compatibility with existing uses on land adjacent thereto; (5) its harmony with the future development of the district; (6) existing topography, drainage, soils types and vegetable cover; and (7) its relationship to the public interest, the purpose and intent of this ordinance and substantial justice to all parties concerned. 19. In addition to the Zoning Ordinance, Buffalo County has a Non-Metallic Mining Ordinance, as required by Wis. Admin. Code § 135.01 et seq., and Wis. Stat. § 295.12. 23. On or about January 13, 2012, an entity allegedly known as R & J Rolling Acres, LLP (“R & J”) submitted an Application for a CUP to Buffalo County for consideration by the BOA. 24. The real property on which R & J proposed to conduct its industrial frac sand mining is in Gilmanton, Wisconsin. 25. On information and belief, neither R & J nor any similarly named business entity is registered as a legal entity in Wisconsin or any other state. 28. Public concern about the mining of frac sand relates to health effects (among other things, from silicosis), safety, truck traffic volume, effects on infrastructure, dust, blasting, noise, effects on the water table, water discharge and runoff, and reclamation. Frac sand mining operation including: mine, wash plant, storm pond, recycle water pond. Noise impacts include excavating equipment and haul trucks. Dust will be controlled by using wet dust sppression (sic) system. There will not be smoke, glare, refuse, gas or effluent resulting from the proposed use. While there are no wetlands indicated on the WIDNR wetland map, there are soils conducive to wetlands north of the property and across STH 88. The haul route from the plant will be to the south on STH 88 to STH 35. There will be 80 trucks/day leaving the site Monday through Friday. Storm water drainage from the site will be directed to the sotrm (sic) pond. Discharge from the pond will be to Pratt Creek on the west side of STH 88. 30. The R & J application included seven exhibits, largely taken straight from public records. 31. These exhibits included: (a) a legal description of the property; (b) a photocopy of an aerial photo of the area; (c) a photocopied plat map of Gilmanton; (d) a hybrid image/map of the property printed from the MapCard website; (e) a similar MapCard map showing labels for “mining area,” “storm pond,” “recycled water pond,” “wash plant,” and “access route”; (f) a “wetlands map”; and (g) a map printed from Google Maps showing the proposed truck route from the proposed mine to a site near the Mississippi River. 32. No further explanation of the proposed industrial mining operations was provided, including the scope, extent or duration of daily operations. 33. The R & J application addressed none of the public health, safety and welfare concerns implicated by a large-scale industrial mine and the associated traffic safety issues created by such an operation. 34. The R & J application included no Environmental Impact Statement and no technical information or evidence relating to issues such as groundwater, storm water and water discharge, water usage, air emissions, noise levels, impact on wetlands, impact on endangered species, impact on historical or archeological sites, site reclamation, and the financial wherewithal of R & J to compensate Buffalo County in the event it fails to satisfy a condition of use leading to damage to the County or its residents. 35. O’Connor resides less than two miles from the site on which R & J proposes to mine. 36. O’Connor, both by himself and through counsel, made numerous written submissions and oral arguments to the BOA stating the reasons the application should be denied. 37. On February 2, 2012, the BOA held its first public meeting on the R & J application. 38. Members of the public who spoke at the meeting commented, among other things, on the minimal information provide by the R & J application. Moreover, as part of the meeting, the BOA visited the site proposed in the application. 39. The BOA held its second public meeting on the R & J application on March 8, 2012. 40. Approximately 200 members of the public attended this meeting, and many provided public comment in opposition to the application. As part of the meeting, the BOA again visited the proposed site. 41. Following the site visit on March 8, 2012, the BOA reconvened, at which time it voted 2-to-1 to deny the R & J application. 42. The primary reason cited by the BOA for its denial was the volume, impact, and safety concerns created by the significant truck traffic that would be generated by the proposed industrial mining activity. 43. Specifically, in its discussion of the “relationship to the public interest, the purpose and intent of the[e Zoning] Ordinance and substantial justice to all parties” contained in its written denial of the R & J application, the BOA addressed entirely traffic-related concerns about the proposed operation. 44. Immediately following the BOA’s denial of the R & J Application, an audio recording captured the comments of Del Twidt who, upon information and belief, currently serves as Chairman of the Buffalo County Board while simultaneously acting as Buffalo County Administrator. 46. On information and belief, Mr. Twidt’s statement was made to one or more members of the BOA and/or the Buffalo County zoning staff. 47. Mr. Twidt is violating Wis. Stat. § 59.18 by serving as Chairman of the Buffalo County Board while also acting as Buffalo County Administrator. 48. R & J did not appeal the March 8, 2012 denial of its CUP application in accordance with Wis. Stat. § 59.694(10). 49. On or about March 20, 2012, the Buffalo County Board of Supervisors approved a “Moratorium on the Expansion and Creation of New Nonmetallic Mining Operations Within the Unincorporated Areas of Buffalo County Pending Further Study” (the “Moratorium”). 50. The Moratorium took effect on March 29, 2012. 54. The plain language of the grandfather clause still requires applicants to establish that any proposed conditional use is allowed under the Zoning Ordinance, which includes establishing that the use is consistent with public health, welfare and safety. 55. On or about March 27, 2012, R & J submitted a new CUP application. 57. The increase from 80 trucks per day in the first R & J application to 126 trucks per day in the second application was made even though concerns about truck traffic safety were plainly the reason the BOA denied its first application. 58. Like the first application, the second R & J application included no Environmental Impact Statement and no technical information or evidence relating to issues of significant concern such as groundwater, storm water and water discharge, water usage, air emissions, noise levels, impact on wetlands, impact on endangered species, impact on historical or archeological sites, site reclamation, and the financial wherewithal of R & J. 59. Like the first application, the second R & J application contained no information addressing public health, safety and welfare concerns relating to industrial frac sand mining and related traffic safety issues. 60. The BOA held its first meeting on the second R & J application on April 19, 2012. 61. In accordance with Wis. Stat. Ch. 985, notices of that meeting were published on April 5 and April 12, 2012. 62. Over 100 people attended that meeting, and several dozen provided public comment. 63. Many of the people providing public comment expressed serious concerns about traffic and transportation safety issues. 64. Additionally, prior to the hearing, several citizens of Buffalo County submitted written opposition to the second R & J application. 65. O’Connor’s attorney from Madison, Wisconsin, filed an opposition to the application, as did his current counsel, Lindquist & Vennum, on behalf of another county resident. 66. Among the many issues raised in public filings and comments in connection with the April 19, 2012 hearing was the need to consider the cumulative truck traffic and impact on infrastructure from the R& J mine specifically, and all of the mines that are the subject of pending applications, more generally. 67. When considered jointly, the number of loaded and unloaded trucks proposed to be driven on roads and highways in Buffalo County each day in connection with pending applications and approved frac sand mining operations is nearly 1,600. 68. O’Connor’s submissions through counsel included an expert report from Clark Dietz, Inc., a Milwaukee engineering firm. 69. Clark Dietz noted significant concerns relating to the use of haul trucks on State Highway 88, including issues with warning signs, shoulder widths, lane width and road layout, road foundation conditions, and surface conditions. 70. The Clark Dietz report noted that their observations of State Highway 88 were consistent with concerns that trucks could not stay in their lanes—that is, that they would cross the yellow line into on-coming traffic—on certain curves on that highway. 73. Although it had not received the WisDOT report on which the delay was based, the BOA held a second meeting on the second R & J application on June 14, 2012. 74. Notices of that meeting were published on May 31 and June 7, 2012, in accordance with Wis. Stat. Ch. 985. 75. Approximately 82 people were present at the June 14 meeting. 76. Like the earlier hearing, members of the public who provided comment at this meeting repeatedly raised concerns about traffic safety. 77. Although the WisDOT report was not completed, a representative from WisDOT presented testimony based on a document entitled “Traffic Safety Impact Assessment – Summary of Initial Finding,” dated June 13, 2012 (the “Initial Finding”). 78. Both the written Initial Finding and the related oral testimony reiterated that further analysis and study was required and ongoing. 81. Additionally, and among other preliminary findings, the preliminary results noted “lane departure concerns” on 20 curves, signage and warning issues, and inadequate stopping sight distances at certain current school bus stops. 83. The BOA held its final meeting on the second R & J application on June 27, 2012, only 13 days after the previous meeting. 84. No published notice was given that the BOA would again take up the R & J application at that meeting, and no public comment was allowed. 85. However, the BOA took oral comments at that meeting from representatives of WisDOT and Glacier Sands, LLC, a company promoting frac sand mining operations in Buffalo County. 86. In fact, Glacier Sands, LLC is identified in both the R & J applications as the “developer” of the mine. 88. The Department of Transportation had not completed its full and final Traffic Safety Impact Assessment relevant to the R & J application as of June 27, 2012. R & J application—and despite the lack of a final Traffic Safety Impact Assessment from WisDOT—the BOA voted to approve the application subject to the conditions stated in the record. 90. The CUP for R & J Rolling Acres was filed in the office of the BOA on July 5, 2012. 91. The BOA’s written findings on the various factors it must consider before issuing a CUP were circular and conclusory and lacked record support or any substantive factual findings. 92. For example, on the question of the compatibility of the proposed industrial mine with the adjacent land, the BOA merely recited that the surrounding land is agricultural and that sand mining is a conditional use in the Agricultural District. 93. This finding appears to rely on an incorrect legal standard, as it fails to show why the use is uniquely appropriate for the site in question. 94. The circularity of the BOA’s finding would render the statutorily required analysis moot and would destroy any distinction between a permitted use and a conditional use. 95. As a matter of fact and law, the BOA’s circular analysis is unsupported. 96. In addition, on the question of the relationship of the proposed use to the public interest, the purpose and intent of the ordinance, and substantial justice to all parties, the BOA merely recited the fact that many concerns were raised by neighbors, county residents, and experts about the traffic levels and safety. 97. The BOA failed to cite any record evidence or supporting information to find that the traffic concerns either were unfounded or were ameliorated in some way by the applicant. 99. However, this was not the conclusion of WisDOT’s June 13 Initial Findings. 100. WisDOT did not complete the full and final Traffic Safety Impact Assessment related to the second R & J application until approximately July 24, 2012—over three weeks after the BOA voted to approve the application. 102. This conclusion is inconsistent with the BOA’s findings approving the second R & J application. 103. Pursuant to Wis. Stat. § 59.694(10), O’Connor seeks judicial review and reversal of the BOA’s decision to grant a conditional use permit to R & J. 104. O’Connor restates and realleges the preceding paragraphs. 105. The application for CUP that the BOA voted to approve on June 27, 2012, was the second application filed by R & J within a span of just over ten weeks. 106. The BOA considered the first R & J application on its merits and rejected it. 107. The sole remedy then available to R & J (assuming, for the sake of argument, that it exists as a legal entity capable of suing or being sued) was to seek certiorari review of the BOA’s March 8, 2012 decision in this Court pursuant to Wis. Stat. § 59.694(10). 108. Because R & J failed to seek certiorari review of the March 8, 2012 BOA decision, that decision operates as collateral estoppel and prevents R & J from submitting a new application for virtually the same proposed mining operation for which it sought approval with its first application. Barber v. Weber, 715 N.W.2d 683, 686-88 (Wis. App. 2006). 109. Accordingly, the BOA had no jurisdiction to consider R & J’s second application for CUP, filed on March 27, 2012. 110. The Court should therefore reverse the BOA’s June 27, 2012 decision granting a CUP to R & J. 111. O’Connor restates and realleges the preceding paragraphs. 112. In ruling on applications for CUPs, the BOA is required to make a reasoned decision on some rational basis. 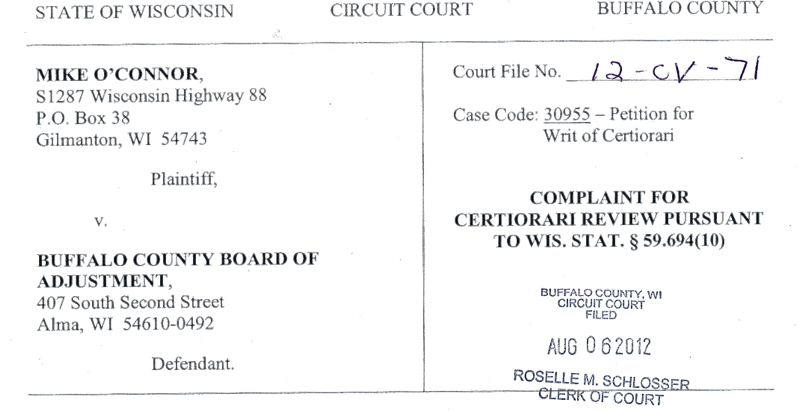 Snyder v. Waukesha County Bd. Of Adjustment, 247 N.W.2d 98, 103 (Wis. 1976). A BOA decision may not be merely arbitrary (defined as “determined by chance, whim, or impulse, and not by necessity, reason, or principle”). Id. 113. On March 8, 2012, the Buffalo County BOA voted to deny an application for CUP from R & J, primarily due to concerns about truck traffic and highway safety. 114. Following the denial of the first R & J application, R & J submitted a second application virtually identical to the one that had just been denied. 115. However, the second R & J application increased the number of daily truck loads proposed to be hauled out of the R & J site—from 80 to 126—and increased the number of days per week—from five to six—on which heavy truck hauling would take place. 116. R & J’s second application addressed none of the reasons underlying the denial of its first application and contained no information from which the BOA could reasonably conclude that the 126 full truckloads per day, six days a week did not present a traffic safety hazard to Buffalo County residents. 117. Given the BOA’s decision on March 8 and the increase in both daily truck volume and hauling days in the second application, the BOA could not have approved the second application without substantial evidence demonstrating that its concerns about traffic and safety were unjustified or had already been adequately addressed. 118. The BOA received no such evidence. 119. To the contrary, the preliminary findings that the BOA received on June 13, 2012 identified numerous safety issues, including lane departure concerns on 20 separate curves. 120. The preliminary findings also expressly stated in two places—in bold, italics, underlined font—that further analysis of transportation safety issues was required. 121. Instead of waiting for the final report from WisDOT, the BOA held a vote with no evidence supporting a finding that the traffic safety issues did not present public health, safety and welfare concerns. 122. This time, the BOA voted to approve the application of R & J. 124. This finding was contrary to the record evidence the BOA had before it. 125. R & J provided no evidence contradicting the Clark Dietz report, the WisDOT preliminary report, or the other public comments on that issue. 126. In approving the second R & J application, the BOA approved 105 loaded trucks a day—25 more trucks a day than R & J proposed in its initial, rejected application. 127. The BOA’s June 27, 2012 decision did not represent its judgment, but rather its will. 128. Because the June 27 decision was made on largely the same information that the BOA had when it voted on March 8, 2012—yet resulted in entirely the opposite outcome—the decision was inherently arbitrary, oppressive and unreasonable. 129. Accordingly, this Court should reverse that decision. 130. O’Connor restates and realleges the preceding paragraphs. 131. Under the Buffalo County Zoning Ordinance, a CUP may only be issued to allow one of the uses specifically enumerated in the Zoning Ordinance. 132. Because the property that is the subject of R & J’s application is in the Agricultural District, any allowed conditional use must be listed in Section 41 of the Zoning Ordinance. Manufacturing and processing of natural mineral resources indigenous to Buffalo County incidental to the extraction of sand and gravel and the quarrying of limestone and other rock for aggregate purposes, including the erection of buildings, and the installation of necessary machinery and equipment incidental thereto, but not the storage of cement, asphalt, or road oils or the mixing of concrete or black top or related materials, provided that any county, town, or municipal government or its agent may store or mix such materials when incidental to the improvement of highways or streets. 134. The phrase “for aggregate purposes” in the Zoning Ordinance means that the only “manufacturing and processing” or “extraction [or] quarrying” that may occur in Buffalo County is for “aggregate purposes,” that is, materials to be used in concrete, cement, asphalt, and black top. 136. Frac sand is not mined for “aggregate purposes,” as it is not sought for use in making construction materials such as cement, asphalt, concrete, or black top. 137. The activity proposed to be carried out by R & J is not an allowed conditional use under the Buffalo County Zoning Ordinance, and the BOA exceeded its jurisdiction by granting a CUP for an unauthorized use. 138. This Court should accordingly reverse the decision of the BOA. 139. O’Connor restates and realleges the preceding paragraphs. 144. Since the Moratorium took effect, Buffalo County has not completed any studies about the “possible impacts” of frac sand mining or amended either its comprehensive plan or its ordinances in response to the concerns set forth in the Moratorium. 145. The concerns about frac sand mining set forth in the Moratorium are factors suggesting a detrimental effect on “the public interest” and a strong likelihood that many “parties concerned” would be denied “substantial justice” by the commencement of frac sand mining operations. 146. R & J presented no evidence that the health and safety concerns identified in the Moratorium had been sufficiently studied and addressed. 147. In its June 27, 2012 decision, the BOA failed to make any findings relevant to the significant public health and safety concerns and open questions identified in the Moratorium. 148. For example, in the paragraph of its decision addressing factor #4 (the compatibility of the proposed conditional use with existing uses on land adjacent thereto), the BOA merely observed the current use of the adjacent lands and made no findings whatsoever about the compatibility of a large-scale industrial frac sand mine with those uses. 149. In addition, in the paragraph of its decision addressing factor #7 (the relationship of the proposed conditional use to the public interest, the purpose and intent of the ordinance and substantial justice to all parties involved), the BOA merely observed that it received substantial public opposition to the application and made no findings whatsoever about the relationship between the proposed frac sand mine and the public interest. 150. Because the law of Buffalo County, as stated in the Moratorium and thereby adopted into its Zoning Ordinance, expressly provides that the County has insufficient information on which to be able to assess whether frac sand mining is consistent with public health and safety and needs time for further study and to adopt adequate regulations, the BOA’s decision to grant a CUP to R & J to allow such mining was inherently arbitrary, oppressive and unreasonable, representing its will rather than its judgment. 151. O’Connor restates and realleges the preceding paragraphs. 152. In voting on applications for CUPs, a board of adjustment is required to make decisions based on its judgment rather than its will or the will of others. 153. The Buffalo County BOA voted on March 8, 2012 to deny the first R & J application. 154. On information and belief, Del Twidt, who is violating Wis. Stat. § 59.18 by serving as the Buffalo County Board Chairman while also acting as Buffalo County Administrator, has exerted pressure on the BOA to approve the applications of R & J and other applicants for CUPs to conduct frac sand mining. 158. The CUP then goes on merely to quote from Section 41.1 of the Zoning Ordinance. 159. This legal conclusion stated in the CUP is circular and meaningless and does nothing more than recite the language of the Zoning Ordinance—which does not, as discussed above, permit frac sand mining. It does not constitute an “interpretation,” and the BOA’s citation to it is further evidence of the pressure placed on the BOA to carry out the will of Mr. Twidt. 160. The BOA’s reference to the “County Board Chair’s interpretation” of Section 41.1 reveals that the BOA did not independently analyze and weigh the language in Section 41.1 but instead deferred to the wishes of Mr. Twidt. 161. This Court’s certiorari review of the BOA’s decision includes a consideration of whether the BOA’s “action was arbitrary, oppressive or unreasonable and represented its will and not its judgment.” State v. Waushara County Bd. of Adjustment, 679 N.W.2d 514, 521 (Wis. 2004). 162. The BOA’s decision did not involve an exercise of its judgment, but rather its will. The decision failed to explain how frac sand mining can be allowed in light of the “aggregate purposes” language in the Zoning Ordinance; it failed to explain how the proposed large-scale mining operation is compatible with the use of surrounding property; and it failed to address any of the significant public health, safety, and welfare concerns repeatedly brought to its attention. 163. The BOA lacked any record evidence to support making a reasoned judgment on the requirements of the Zoning Ordinance. 164. Because the BOA’s decision to grant a CUP to R & J represented its will—or the will imposed on it by others—and not its judgment, the Court should reverse that decision. 165. O’Connor restates and realleges the preceding paragraphs. 170. The BOA failed to publish any notice that the R & J application would be considered on June 27, 2012. 171. The filed decision of the BOA confirms that the only published notice given related to the second R & J application was on April 5 and April 12, 2012 (in advance of the April 19, 2012 meeting) and on May 31 and June 7, 2012 (in advance of the June 14, 2012 meeting). 172. Because the BOA met on June 27, 2012 and voted on the second R & J application in plain violation of the Zoning Ordinance and Wis. Stat. Ch. 985, its vote approving that application was outside its jurisdiction. 173. Although public notice was not provided, BOA allowed representatives from Glacier Sands, an advocate for and interested party in the proposed mine, to speak at the meeting. 174. Further, because the vote of the BOA occurred at a meeting for which no published notice was given, the CUP issued to R & J is void and of no effect. Gloudeman v. City of St. Francis, 422 N.W.2d 864 (Wis. App. 1988). 175. O’Connor restates and realleges the preceding paragraphs. 176. The CUP issued by the BOA was issued to R & J Rolling Acres. 177. Both CUP applications identify this entity as R & J Rolling Acres, LLP. 178. The “LLP” designation is allowed only for partnerships that have registered under the laws of Wisconsin or some other state as registered limited liability partnerships. Wis. Stat. § 178.42. 179. R & J has never registered to do business in Wisconsin or any other state. 180. Likewise, there is no “R & J Rolling Acres” of record in any form, whether as a limited liability company or otherwise. 181. Accordingly R & J also has no registered agent or registered office address. 182. The conditions on which the CUP was issued must be satisfied by the permit holder. 183. In this case, the permit holder is R & J Rolling Acres, LLP. 184. Because R & J does not exist as a valid legal business entity, the conditions listed in the CUP issued by Buffalo County are not legally enforceable against it. 185. R & J, as a non-existent entity, also lacks the capacity to transfer a CUP to another entity that is properly formed and registered. 186. Because R & J is not a valid legal entity, the decision of the BOA to grant that CUP is inherently arbitrary and unreasonable. 187. Furthermore, the decision of the BOA to grant a CUP to a non-existent business entity was made under an incorrect theory of law because the BOA erroneously assumed the enforceability of the conditions it set in the CUP. 188. Accordingly, this Court should reverse the BOA’s decision. 189. O’Connor restates and realleges the preceding paragraphs. 191. Neither the first nor the second R & J application contained the map required by section 202. 192. Without even this basic information required for all zoning permits and conditional use permits, the BOA had little or no evidence before it on which to determine that certain key conditions it imposed in the CUP were reasonable or appropriate, such as: that the finished grade at the site be at least 10 feet above groundwater (condition #9); that up to 105 trucks per day, of up to 80,000 lb. each, be to be allowed to haul mined frac sand (condition #27); that testing of nearby residential wells occur on only an annual basis (condition #32); and that wash ponds be engineered “to include the 24-hour, 25 year storm event for any potential storm water runoff as well as any directly contributing rainfall event” (condition #33). 194. The BOA should have required, for example, the submission of an Environmental Impact Statement, as well as technical evidence relating to, among other things, groundwater, storm water and water discharge, water usage, air emissions, noise levels, impact on wetlands, impact on endangered species, site reclamation, and the financial wherewithal of R & J. 195. This Court should reverse the BOA’s grant of a CUP to R & J because the application was incomplete and contained insufficient evidence on which to base its decision and on which to fashion reasonable conditions. 3. Such other relief as the Court deems just and equitable.